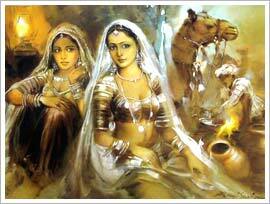 Paintings of Rajasthan have found patronage with the royals as well as with the common people since time immemorial. There are several forms of painting in Rajasthan as well as schools that developed as a result of the styles adopted by the artistes. Painting in Rajasthan is done not just on paper and cloth but also on the walls and ceilings of homes and temples. Tradition of painting can be traced back to the dawn of civilization. Traces of earth coloured drawings on walls and intricate motifs of geometrical and natural designs on clay vessels and pottery have been unearthed in the proto-historic Harappan sites of Kalibangan and Peelibanga in north-western Rajasthan. The paintings of Rajasthan, namely the Pichwais, Miniatures and Phads, all are collectibles. Mughal influence can be seen in some of the painting techniques. Themes of miniature paintings are selected from the religious texts and mythologies, viz. the stories from Krishna Leela, Ramayana and the Bhagvad Puran. These paintings are made on paper with vegetable dyes. Rajasthan has seven different schools of miniature painting; prominent among these are the Bundi, Kota and Mewar (Udaipur) schools. Phads are scroll paintings used by the Bhopas and the Pichwais are painted cloth hangings used behind the deity in Vaishnava temples. Painted in bright colours with bold outlines, both these art forms have very strong religious traditions. The artist who works on these paintings considers himself to be a servant of the Lord and puts in shraddha (devotion) on each pichwai or phad that he paints. Commercial works in these styles are also available. Rajasthan is known for the quality of its marble and other stones found here. Easy availability of these materials has given rise to a tradition of sculpture and carvings. The sculptures are usually found in the various forts and palaces. Carvings can also be seen in the monuments in the form of lattice windows, screens and balconies. Exquisite carved or sculpted marble and metal figurines and objects make wonderful mementos and gifts. While the carved objects and furniture are good for decorating the home in traditional ethnic Indian style.